Easily visualize data that shows the impact of your security efforts and gain a better understanding of the threats your organization faces. Monitor your security operations and intelligence in a way that is actionable and meaningful for you and your team. With customizable reports you can access the information you need in a digestible format. Whether you’re working in threat intelligence, security operations, incident response, or on the security leadership team, you can build insightful and unique dashboards to meet your specific needs. By configuring multiple dashboards, you have flexibility depending on current priorities, as well as the ability to easily share them with other stakeholders in your organization. 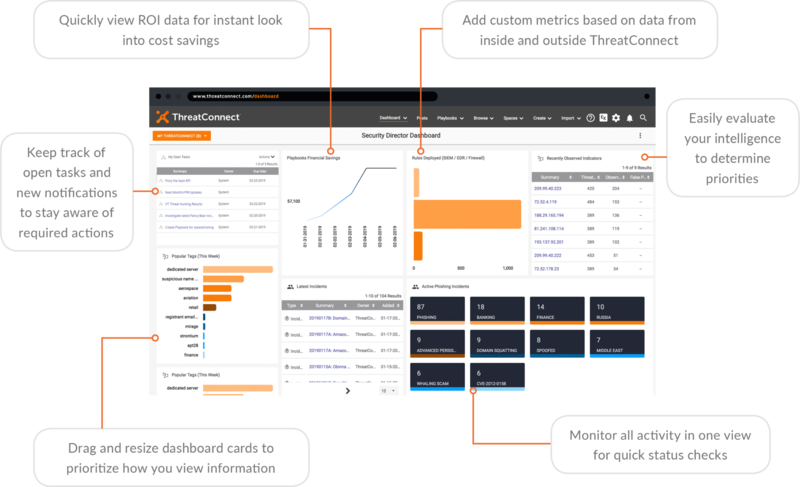 It’s easy to export reports on various types of data from ThreatConnect® and disperse it throughout your organization. Download Threat Reports as PDFs with focuses on specific threat actors or campaigns. And, use the information from the Playbooks ROI Calculator to fuel executive level reports on items such as cost savings by implementing automation & orchestration.